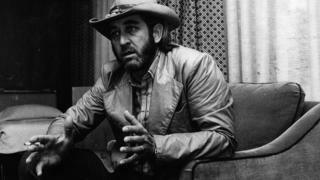 US country music singer Don Williams - who enjoyed great success with his easy-going singing style - has died aged 78 after a short illness. Williams began his solo career in 1971, amassing 17 number one country hits. His songs such as Gypsy Woman and Tulsa Time, were covered by singers such as Eric Clapton and Pete Townshend. Another country star, Troy Gentry, also died on Friday in a helicopter crash. Williams' other hits included You're My Best Friend, I Believe in You and Lord, I Hope This Day Is Good. In 2010, he was inducted into the Country Music Hall of Fame. The news of the death of 50-year-old Troy Gentry has shocked country music fans and artists. "It is with great sadness that we confirm that Troy Gentry, half of the popular country duo, Montgomery Gentry, was tragically killed in a helicopter crash which took place at approximately 1:00pm today in Medford, New Jersey," a statement of the band's website said. The helicopter's pilot also died in the incident, but the reasons for the crash remain unclear. The country duo, who were brothers, formed in 1999 and had released eight studio albums. Country music stars including Sheryl Crow paid tribute to Gentry on social media. Grammy award-winning Singer Brad Paisley said he was "heartbroken and in disbelief" at the news of Gentry's death in a Friday night tweet.